Stuart and Sons pianos is a relatively new brand in the industry, having been established in 1990. Stuart & Sons is an Australian manufacturer of handcrafted grand pianos. The company later forged partnership with Albert Music. Stuart and Sons primarily use Australian timbers for construction. The company is located in Newcastle, New South Wales. The Dutch-Australian pianist Gerard Willems used a Stuart & Sons piano when he recorded the complete piano sonata cycle of Ludwig van Beethoven in 1999 and 2000. Stuart and Sons manufactures grand pianos with 14 more keys compared to what a standard piano offers. Although several manufacturers have created pianos that reach nine notes lower in the bass, the company still holds that no other piano manufacturer has ever produced pianos the way they do, with notes reaching above C8 (Middlec C + four octaves + 5 keys [F, octave 8]) on their keyboard. 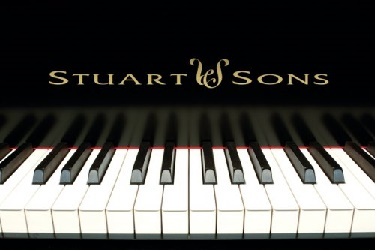 Stuart and Sons was established in 1990 as Stuart & Sons Terra Australis Pty Limited and later formed a partnership with Albert Music, formally known as Albert Investments Pty Ltd. Now it trades under the name of Piano Australia Pty Ltd, the partnership between Stuart and Sons and Albert Music. Though not as tested by time as other piano brands that have been on the market for hundreds of years, Stuart and Sons have made several and effective innovations in their instruments. Their innovations includes the Stuart Agraffe, the Fourth Pedal and their extended keyboards. Agraffe. This is a scientifically designed vertical coupling device that allows the strings to vibrate in a more controlled approach. The agraffe holds the strings vertically, in the same direction where the hammer strikes (unlike the traditional method, where the strings are held horizontally by two off set metal pins) this mechanism resulting in a constant vibration that provides an exceptional forceful range, longer sound duration and greater clarity of sound sympathetic to the whole piano spectrum. Fourth Pedal. This additional pedal affects the attack transients by reducing the velocity of the action’s movement. This is achieved by reducing the travel distance of the hammer and key levers. This pedal can be used independently or simultaneously with the shift pedal to produce the most amazing effects. Extended Keyboard. Unlike the traditional keyboard of a piano that consists of 88 keys, Stuart and Sons pianos come in 97 and 102 keys. The 102 keys give nine extra keys in the bass and five in the treble an additional 24 strings. The 97 key model has four extra keys in the bass and five in the treble.